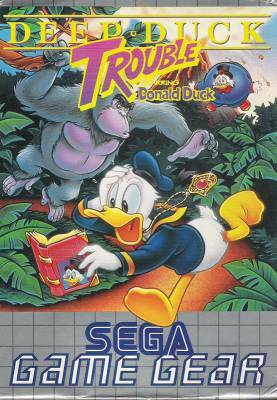 Deep Duck Trouble (Starring Donald Duck) / Donald Duck no Yottsu no Hihou (ドナルドダックの４つの秘宝) - Games - SMS Power! While off on a far-flung treasure hunt, Uncle Scrooge picked up a mysterious pendant. Now he's swelling up like a balloon! 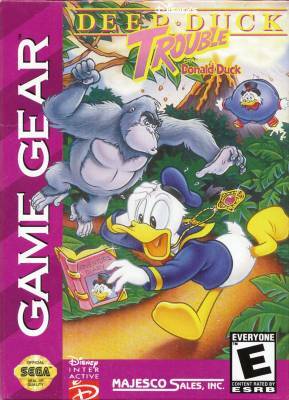 Can Donald save his ever-expanding uncle! Donald treks to the most dangerous spots on earth to return the pendant and break the curse! Zig-zag through a treacherous forest, a shark infested sunken galleon, icy caverns and into the crater of a hot volcano! Tail-feathers fly as Donald fights off hyenas, snakes, gorillas, barracudas, sharks, weasels and thundering lava balls!